"I want to create affluence in Jeju." 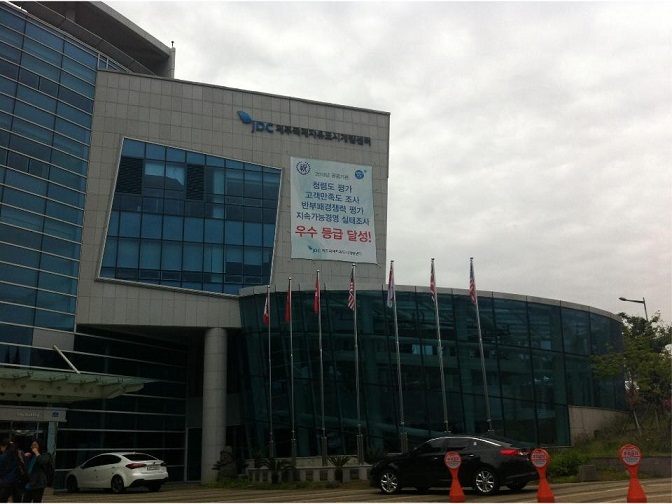 On May 17th, there was a press conference at the JDC , the buisness that strives to make Jeju a better and famous place. It was with Kim Han-wook, who is the JDC chairman. The JDC headquarters is in a very big, blue building. In the downstairs display, it showed JDC’s history and the objectives for what the JDC hopes to do in the future. For example, mongni, is a product that JDC made to promote Jeju Island. Also, it showed comestics that were made from Jeju Island’s natural products and resources. The JDC has already completed making the ‘Learn English city’, the ‘Jeju Aerospace Museum’, and countless duty-free shops to promote Jeju and Korea to foreigners and other people who visit Korea. In the future the, JDC is making plans for a new English camp. These plans will include openings for many great and talented people. It is a very important plan. Kim Han-wook, wants to focus on Jeju’s tourism and help make Jeju become popular and famous to people around the world. When asked what would happen to the people of Jeju when it became a free international city, he answered with, “Maybe, they will get quality life and grace will be better.” If Jeju become free international city, many foreigner come to Jeju, and islanders can talk easily with them. And people who come to Jeju can see and come in many Jeju’s festival. Maybe, if Jeju really become a free international city, many people concerned Jeju, too. When asked about the JDC’s future plans, he said, “I want to create affluence in Jeju and we should preserve the island as well to keep a beautiful Jeju forr ou descendants. A long time ago, Korea had many worrying times. But now, we have become very cool country!” He also said he wants to preserve Jeju’s own culture like our ancestors did before. After the interview was finished, Kim showed a video about the various JDC projects. The video was short but it showed details about all about things JDC does . That video show JDC’s projects like the new museums, and preserving the forest. It showed many tourist attraction, too. It was a very good education for the students to learn more about how to strengthen Jeju Island for the future.